Producer Alexander Rodnanskiy to start shooting film about Russian social network giant VKontakte this year after considerable delay. The film, which is based on The Durov Code, Nikolay Kononov’s 2012 book about VK’s founder Pavel Durov, was due to premiere back in 2014 but was stalled when Rodnanskiy returned 25 million rubles of funding to the production company in exchange for freedom to change the script. According to Rodnanskiy, the film will no longer be a biopic on Durov but a multi-plot drama about “the internet as a space for human emotions”. Although Fodor Sergeyevich Bondarchuk, who was to direct the film, has left the project due to conflicting schedules, Rodnanskiy has confirmed that the film will go ahead and even has “potential for a franchise”. Plans for the film were first announced shortly after the success of David Fincher’s 2010 The Social Network, a drama about Facebook starring Jesse Eisenberg as the company's founder Mark Zuckerberg. Though Rodnanskiy has not commented on the matter, the changes to the film’s focus reflect Pavel Durov’s dismissal as CEO of Vkontakte in April last year. 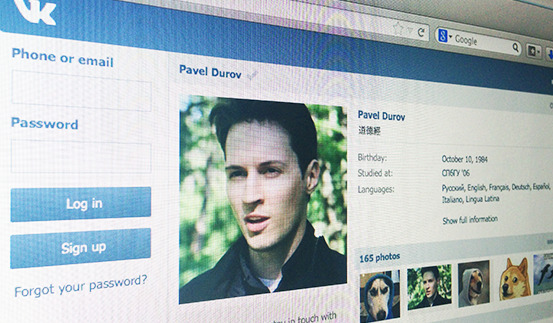 The social network, which was founded by Durov in 2006, is currently controlled by former deputy prime minister Igor Sechin and owner of Mail.ru Alisher Usmanov.